The Sharp End of the Spear | Military Fiction and History for the thinking man. I recently published a fascinating interview with a South African Recce Veteran of the South African Border War for SOFREP. I would like to repost it here. My writing on SOFREP has been limited to Rhodesia and its Special Operations Units during the Bush War. Trying to understand the conflicts in Southern Africa require a historical setting and an understanding of the history and culture of those nations. Most Americans see the end of the Vietnam War as a détente of sorts with the Soviet Union. In essence, the Cold War went cold. For the people of South Africa, the combined efforts of the Soviets, East Germans, North Korea, China and Cuba extended the Cold War into a very hot fight for the expansionist ideals of Communism. In Rhodesia, Communism took on the mask of Black Nationalism. The Soviets and Chinese sought to exploit the West’s decision to withdraw from Colonialism and absentee governance of nations on a far off continent. The nation of South Africa watched Rhodesia closely and offered assistance in aircraft, material and personnel to an extent but as early as 1966, encroachment on and within their borders began with terroristic activities of a whole host of insurgent groups. South West Africa / Namibia’s border with Angola started to produce similar activity as in Rhodesia. SWAPO (South West Africa People’s Organization) began attacking white farms and civilian targets. All of this festered along with a long running civil war in Angola against the colonial rule of Portugal until in 1975. That nation packed up and left. While warring groups sought control, the Communist powerhouses used the opportunity to strike against the South Africans. SWA/Namibia was given to South Africa to administer after WW1 and many settlers farmed the territory. As the United Nations came into being, disputes over who would run the country arose and were not settled until the late 1980’s. In the meantime, South Africa believed that should the country be ruled by Russian and Chinese military powers, the next domino to fall would be South Africa itself. It was a fight against Communism. The western media chose to ignore the issue of a massive military buildup around South Africa and turned the issue to a single but important issue. Apartheid. This institution was dying a slow death as the generation who brought it into being were losing its grip. Rather than viewing the Border War in its proper context, South Africa was isolated and became a pariah to the world over this. A proper view would see the massive Communist intent on invading South Africa and Communism/Marxism as an issue of stopping a machine that would destroy any freedom or hope thereof for all peoples in South Africa. Apartheid was an internal issue that was being dealt with and would resolve itself in time. In the meantime, South Africa would go it alone in its fight to preserve its borders and security. The rough and unforgiving terrain of Africa, combined with the ultra violent nature of the insurgents backed by legitimate conventional military force would naturally produce a rare breed of soldier to fight back, especially ones who would take on unconventional roles in Reconnaissance and Direct Action duty. Among those groups that rose to legendary status was the South African Recce. In an age before drones and sophisticated ISR military technology, men required to take the battle to the enemy would have to be a breed apart. Men who could ruck 150 pounds of equipment on their back across the rugged, parched African terrain in two or three man teams, undetected and self-reliant. Men who could operate beyond the reach of air support and quick extracts. Should they be detected or encounter the enemy, they might be required to Escape and Evade for 150-200 kilometers back to safe territory. Their story, which I will be presenting in upcoming articles, is nothing less than astonishing and almost hard to believe. To say that these men were elite is an understatement. There are few books written by ex Recce’s themselves. Major Jack Greeff has penned a book that covers his life in the Recces in the hottest part of the Border War. What unfolds is an incredible adventure that reads like a great novel but there is nothing imaginary here. After joining the South African Army at 16 years of age, he learns his craft as an infantryman and then after spending time observing these unflappable and brave men, he sets to become one of them. In his journey, he not only becomes one of them but one whose reputation has lived long after his service. He is still a bushman at heart, working to train Game Rangers in the fight against poachers in Africa. It is often hard to contact him as he is usually in the Bush using the skills for war in another just cause to save Africa’s wildlife. Major Greeff was generous enough with his time to do an interview for SOFREP. I felt it best to introduce our readers to this world with a good book recommendation and an actual interview with these extraordinary but often elusive men. Hello Major, thank you for taking the time to speak with the readers of SOFREP. 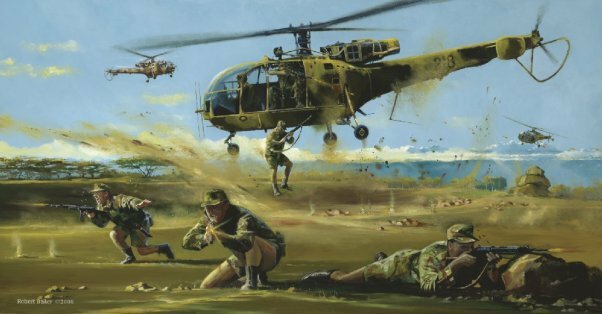 Many of our readers have become familiar with the Bush War in Rhodesia but most are unfamiliar with the Border War in South Africa. Most westerners understanding of South Africa revolves solely around Apartheid, unfortunately. The South African Defense Force, like Rhodesia was fighting a war against Communism. Communist forces from Angola, Mozambique. In your book, we find out that you were part of 5 SAI for a number of years. It appears that you joined very young and held the record for the youngest instructor in the school of infantry and became proficient with the Mortar at 16 years old? At what age were men able to join the Army? I was part of 5 South African Infantry Battalion for 5 years doing infantry operations on the border areas. At that time we could leave school at age 16 and a lot of males did join the government sectors such as Police, Railways and Military at young ages. I completed my high school doing a correspondence course and later became an officer. I was 16 years old when I did the Instructors course for permanent force soldiers. The mortar training came later. Early in the Border War, most of the action was taking place on the Angolan and South West African border. This consisted of a cut line straight across the length of Angola. How often were troops in the early 70’s allowed to go across and pursue SWAPO and other enemy groups? As the war intensified, you struck deeper into Angola, correct? In the early 70s our operations were mainly south of the border cutline but the occasional logistic support was given to the Portuguese army across the border. The odd Intelligence operation was also carried out but I have not much knowledge of that. You mention that you were assigned a mission consisting of advising FNLA due to your skill with the Mortar? Was this normal for non-Special Forces to Advise foreign troops? With the start of the Angolan Civil War in 1995, the Recces were still a very small unit and they were quickly deployed with the first group of FNLA guerrillas to train them. The army then needed more training teams and set out recruiting volunteers from Infantry Units such as 5 SAI. That is where I ended up as a mortar instructor training a faction of the FNLA under Daniel Chipenda at that time. This force then set forth, joined other task forces and advanced towards Luanda. You begin to mention being around a different sort of soldier , the men of the Reconnaissance Regiment, or Recces. As a young soldier, what was it that drew you to want to be among these men? They were professional, casual in their ways in the unit and very brave and aggressive, I thought. It appealed to me and I wanted to become a Recce Commando. Jan Breytenbach, the father of 3 Special Operations units in South Africa- 32 Battalion, The Recces, and the 44th Parabats / Pathfinders was often present. It isn’t often a full Colonel is in the thick of battle leading his men from the front lines. Most men are back in HQ receiving information through the communications systems. Did he continue to have a presence and voice over the course of the war? Colonel Jan Breytenbach was and still is a soldier’s man. He was not a career officer but a professional soldier. He knew what his men needed on the ground and knew the enemy. He was always in the thick of things and was not interested to become a general. Many of our fighting generals did not see eye to eye with him. He had an influence throughout the war. Our best combat commanding officer of the war, no doubt. Because he knew the terrain and the enemy well, he could influence any form of combat mission from airborne parachute assaults, ground foot attacks, Guerrilla operations, motorized attacks and even conventional army mechanized operations. Alot of people argue over who has the toughest selection process to gain entry into the Operational Training pipeline of Tier One units. The Rhodesian SAS, Selous Scouts and the Recce’s selection seems to be the harshest that I have read about. What do you think differentiates these selections from others? ( I would guess that the constant food deprivation is one. SEALS are fed 4-6000 calories a day ) Can you describe the depths of hardship that they put you through that modern Armies would consider inhumane? The nature of operations on the Southern African continent requires tough and fit soldiers. The terrain dictates the nature of the operations and the chances of success or failure. The African is a tough human being and the African Guerrilla is a breed of their own. They can survive under extreme conditions and is extremely mobile on foot. In order for Special Forces to be able to operate under these conditions our selection process had to be aimed at selecting soldiers that can endure in these battle conditions. Our external Recon operations seldom lasted under seven days during which the team had to carry all their water and food for the period. Many of our operations stretched over 14 to 21 days before resupply was received. During our winters water is very scarce and the few water sources are used by the enemy as well and in most cases in Angola, dominated by the enemy. Any attempt to collect water can lead to the spoor of the team being detected and the team then tracked down by large enemy forces resulting in follow up operations lasting days during which teams are chased and hunted down. I agree, probably the worst thing of our selection courses was the food deprivation. It is difficult to describe the hunger and weakness caused by poor nutrition for extended periods. Besides small unit tactics, how much do you think that the African theater of War, the land itself required an extra measure of harshness to become a Recce? Most of our operations were extended of nature lasting from a week long Recon mission across the border to several months with guerrilla forces. The harsh terrain and high mobility of the African Guerrilla forces pushed our physical capabilities to the limits. This is in contrast with most other countries which execute “short raids” or what was called Long Range Recon Patrols in Vietnam. In contrast with jungle operations which is less demanding due to the availability of water and wild foods. Our distances into enemy territory can be as far as 20 to 1000 kilometers behind enemy lines with NO support. Yes I repeat, NO support. A two man team is on their own and if one is injured or falls ill he can face a lonely death. There was no immediate air support when operating 500 to 1000 kilometers in the enemy’s back yard. Most of the times our backpacks weighed not under 60 kilograms loaded with HF radio communications gear, food, water, explosives, recon kit, etc. Any emergency will set in motion a series of rescue attempts by either aircraft or naval vessels visiting pre-determined RVs. This will require that the team have to evade the enemy for an extended period of time, surviving as they go and living off the land so to speak. In Africa most rural people are natural trackers. This made patrol movement in enemy areas extremely hazardous especially in the winter months when most grass was burnt and the sandy soil made anti tracking extremely difficult. Patrol tactics had to be adjusted and adapted to accommodate this threat. The land was dry, rugged and covered in thorn bush. Water was always a limiting factor and to endure in these conditions the operators had to be fit and well acclimatized. It is a known fact that early on, the Americans wanted to back UNITA, however there is much debate over the actual presence of American troops on the ground to help train troops. One popular rumor is that a Black Green Beret ‘ A’ Team was once deployed to work with UNITA and assess things and report back the overall situation and the worthiness of supporting UNITA. I have personally never seen an American Green Beret A Team or any USA operator while working with UNITA although there were rumors of US Operators escorting Stinger Missiles etc. I never saw any. South Africa was a lifeline for Rhodesia throughout the course of their war. Few people realize that South Africa sent troops north to help with their manpower shortage and for Special Forces Units to gain experience. You were a part of ‘D’ Squadron, a South African contingent that helped fight FRELIMO and ZANU in Mozambique. That information remained classified well into the 80’s due to politics. Do you feel that it was important for the Unit to work with the SAS or did you have enough business of your own that it was really just a favor? The Recce Units went to Rhodesia to assist the SAS with their operations in Mozambique and Zambia. These operations were a great learning school and the units quickly got up to standard as far as long distance HF Radio communications and minor tactics were concerned. The enemy (FRELIMO) was aggressive and many of these cross border operations ended up in a run for safety after being compromised or after an ambush, with a large follow up force on our tracks. These “runs” were referred to as “Gunston 500 Rallys”. We did a lot of anti-tracking, automatic ambushes and booby traps to shake them off. It was a great learning school that prepared us for our operations in Angola. Not a waste of time. Your life now is dedicated to training wildlife Rangers and providing security against poachers. Are any of these poachers an opponent to be feared by trained soldiers? Has their level of sophistication risen to that level? Do you believe that the war against the wildlife of South Africa can be won or is the corruption at a level that makes it all but impossible to stamp out? I am now using my military expertise in small team tactics to teach Wildlife Rangers tactics which they can use in the war against rhino poachers. The rhino poachers vary in their makeup from a totally untrained person to some who are well trained in firearms and military skills. Many are ex Mozambique Army or Zimbabwe Army troops selling their expertise. So called “imports”. To date we have not yet lost a ranger in an armed contact with poachers in SA. But, it takes only one bullet from even a rusted old bolt action rifle to kill a person. The training is therefore focused on small team tactics by two man patrols. These patrols are taught to shoot quick and accurate, referred to as “Quick Kill” shooting techniques. The rangers are also taught how to act during armed contacts during day and night operations. Bush craft is a must for these rangers and most of them are highly skilled trackers gathering all their field intelligence from tracking and ground coverage. Poachers are glorified by the press. They are nothing but criminals driven by greed. The war against poaching can be won but it will need a political and a military victory to achieve. We as Rangers can only stem the tide while the politicians try and get the demand and the price of rhino horn down. This one is 9.99!! E book. Much more expensive. Please include B/N as it is affordable.